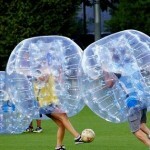 Homepage>Barcelona>Bubble Football for the Win! Bubble Football for the Win! We’ve got such a variety of team building activities for corporate groups, from exclusive vineyard visits to football tickets, but sometimes what’s needed to really bring everyone together is something unusual and unexpected. 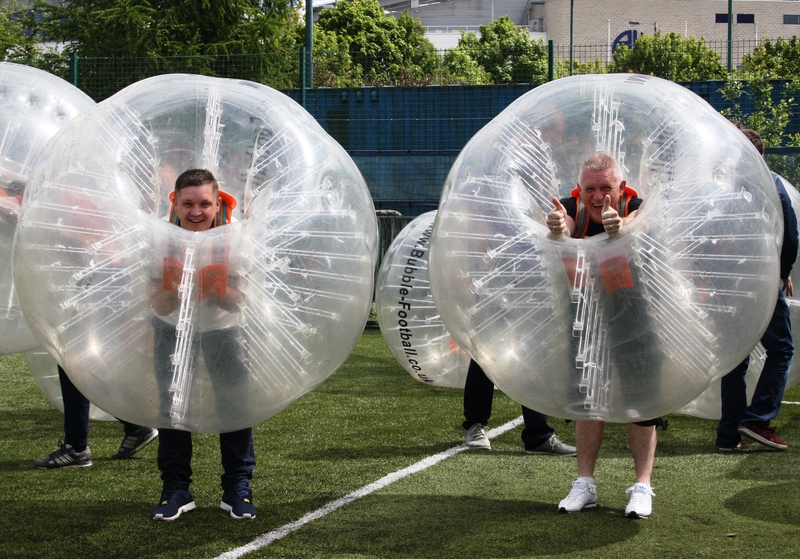 At Red Mago we suggest one of our most famous team building events, BUBBLE FOOTBALL. 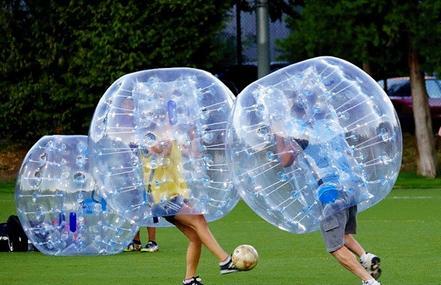 First off, Bubble Football is perfect for groups of people with different levels of physical fitness, because that part of the playing field has been leveled by the giant lightweight bubble costumes! 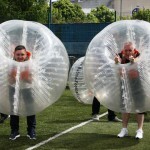 Anyone can participate and experience the fun of being part of an unstoppable squad of inflated footballers. Let the bouncing begin! 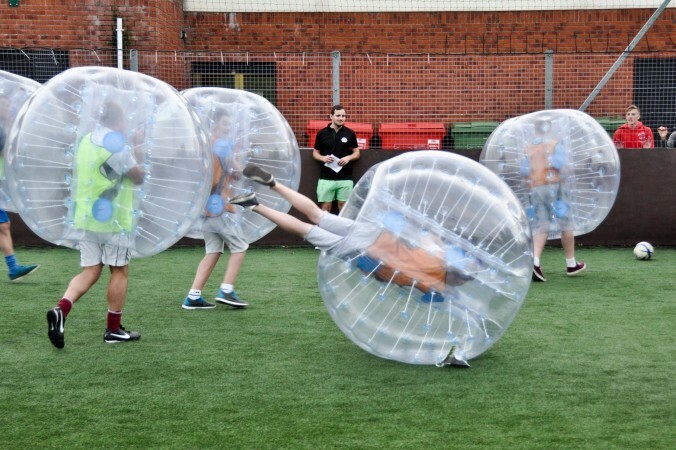 How does one begin to describe what bubble football is? Even the pitch is different! It’s enclosed to maximise the bouncing and make sure no-one is ever too far from the action. You’ve never in your life witnessed the surreal sight of your friends and colleagues running around with transparent spherical bouncy castles on them – it is universally recognised as being ridiculously funny – and now it’s your turn! 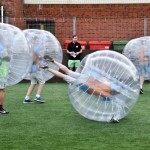 While the numbers suggest this is a game of traditional five-a-side football, everything you are used to is transformed once each team dons their specially inflated bubbles. 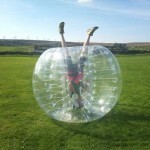 Each person is nearly completely surrounded by their impenetrable and very bouncy bubble with just the legs sticking out below the knees. There are handles within the bubble so you have a good grip on things, and the most fun, aside from the ridiculousness of running around with a giant sphere, is impacting with your friends and colleagues on the opposing team… and your own!…..and now it’s kickoff time! The whistle blows and it’s game on! The pitch is enclosed so the players bounce off the walls – strength and speed give way to a natural instinct to bounce the opposing players out of the way – round and round they’ll go. You have never seen a game of five-a-side like this. There is triumph, heartbreak, but mainly a great deal of squashing and laughter. If your group is bigger than ten it’s very easy to exchange and take turns in the bubbles. Substitutions are regular occurrences! Nothing brings a group together like the shared fun of bouncing around on our customised pitch. The monitors help conduct short 10-minute games to keep everything moving, and there are a variety of other games and diversions to try as well. A classic favourite is a round of British Bulldog at the end. Everybody wins. This highly unusual activity is a surefire hit with groups looking to elevate their sense of fun by celebrating the ridiculousness of this ‘sport’. no matter what your ability, everyone is on equal footing once a bubble is on. The most important aspect is the entertainment and the memories that are made. This highly photogenic event is sure to produce some great photos and videos to share for later. There’s a bar onesite as well in case anyone wants a drink or two – and it’s assured that Bubble Football works up a mighty thirst! There are bleachers to watch the event unfold as you take a breather and work up the gumption to enter the fray again! As with all our corporate events, we have a variety of transportation options available to get you and your group comfortably to and from the venue so you can just enjoy the experience. After 60 minutes you are sure to be knackered and ready for something a bit more refined: how about a lovely catamaran cruise with an open bar? Nothing says success like a great reward for a job well done. Contact one of our representatives to arrange a team building event in Spain and Portugal that really brings everybody together!